After having great success with his first mostly live action film, Song of the South, Walt Disney decided to cast his two contracted child stars, Bobby Driscoll and Luana Patten, in a completely live action film. As source material, Walt chose a charming book about a boy and a lamb called Midnight and Jeremiah by Sterling North. Walt Disney was born in 1901 and the story takes place in 1903, so it must have had great nostalgic value for him. In addition, the story called for a big steam train in the beginning and Walt was a train enthusiast, so the ability to work with trains was most likely another huge draw. To direct the film, Walt hired Harold Schuster, who had recently directed My Friend Flicka for Fox. Walt's wife and daughters were so taken with that film and Walt wanted a professional director this time around because production on Song of the South went over time and budget. Schuster cast Beulah Bondi as Jeremiah's grandmother. Singing star Burl Ive's was cast in his first film role as Jeremiah's uncle. Filming was done almost completely in the Sequoia Valley. The exteriors of most of the sets also contained the interiors. Walt was so interested in this that he personally built the model that was used to build the Kincaid farm. It is currently on display at Walt Disney World. When the industry trade papers announced that Walt Disney was making an all live action film, there was a general feeling of distaste towards the idea. Walt Disney was an animation studio, not a live action studio, and even though Song of the South was 2/3rds live action, audiences weren't ready for a Disney film without animation. So at the last minute, Walt decided to add a few animated sequences to appease the general public. These sequences serve little purpose to the story other than setting the tone and providing an excuse for more songs. The story starts with a narration from grown up Jeremiah. A train rolls into town, causing big excitment from nearly all of its inhabitants. To everyone's delight, Dan Patch, a famous race horse, gets off the train to get a shoe repaired. When the family gets a black sheep, Jeremiah begs Granny to let him keep it. He names the lamb Danny, after Dan Patch, in hopes that Danny will become a prize winning sheep. As Danny grows bigger, he causes more and more trouble for Jeremiah by destroying a lot of screen doors, so Uncle Harem builds Danny a suitable fence as Danny prepares to take him to the county fair. It takes some convincing to get Granny to go, but she agrees to go if Jeremiah can raise enough money. He earns the cash by selling wild honey, but once he's got it Danny escapes and runs away. However, he is found the next day and they go to the fair. Another lamb wins the blue ribbon, but the judge then explains that Danny is in a class of his own and therefore it wasn't fair to compare him to the other lambs. They instead give Danny a special merit award. As the film ends, the train rolls back into town as the whole town gathers to see Danny, the special award winning lamb. So Dear to My Heart premiered on November 29, 1948, in Chicago, IL. For the first time since Bambi, critics praised a Walt Disney film. They loved the sentimentality and nostalgia of it. The song "Lavender Blue" was nominated for an Academy Award that year. Sadly, Disney had a hard time selling the film to audiences and it was not a box office success. However, Walt Disney was very proud of the film. He heralded it as one of his finest live action features. When Walt Disney built Disneyland, the Imagineers used the blueprints of the train station from So Dear to My Heart to build the Frontierland station. It is an almost exact replica of the one from the film. There's a charming innocence about films that take place at the turn of the century that really appeals to me. Many of my favorite live action Disney films take place at the turn of the century. And while So Dear to My Heart isn't an all time favorite of mine, it is a great film. It's a simple story about a simpler time filled with lovable characters. Sadly, the film was never a success and has faded into obscurity over the years. It has had countless TV airings and was released several times on VHS, once as part of the 'Walt Disney Masterpiece Collection,' so audiences have had plenty of opportunities to fall in love with it. It is a shame that the film has never enjoyed the success that it deserves. So Dear to My Heart is currently available on DVD as a Disney Movie Club Exclusive. It is also available on iTunes where it can be purchased in HD. I bought this recently but I'd never watched it before. does anyone know where i can watch this movie? reading this review has inspired me to watch it, but no matter how many sites i use, i can't find it!!! 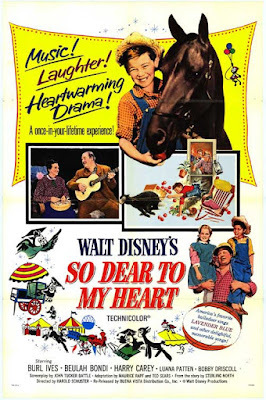 So Dear to My Heart is available as a streaming rental from Disney Movies Online (http://disneymoviesonline.go.com/movies/so-dear-to-my-heart-750000000123/) for $2.99. If you aren't a member of the Disney Movie Club, you can redeem points for a copy through Disney Movie Rewards, where it is 550 points (about 6 DVDs worth of points). I hope this was helpful. thanks heaps! means allot to me!! and yes, the info is helpful! Thanks for reviewing a wonderful family film that should be better known! However, it wasn't Burl Ives' 1st film but his 4th. He previously appeared in Smoky, Green Grass of Wyoming, and Station West.